Licensed, Bonded, and Insured. Quality Pro Certified. Members of Rutherford Chamber of Commerce and National Pest Management Association. Our Certified Technicians receive annual continuing education training. 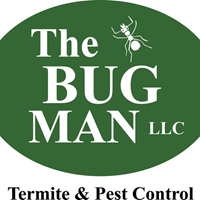 The Bug Man specializes in termite, pest, and mosquito management programs. We are a locally owned and operated family business located in Murfreesboro, TN. Voted #1 Pest Control Company in the Ruthies Awards for 8 consecutive years and Best Bug Zapper in the Besties Awards for 5 consecutive years. Bugs are our business! Extremely conscientious in taking care of our needs, with follow up if needed. I have been with The Bug Man for almost 7 years. Not once have they been late with their appointments. Every technician is most courteous and professional. Great job. The representative, Orlando, did an outstanding job inspecting and explaining our options. Very customer centered. I highly recommend this service provider. Always on time, knowledgeable, affordable, and friendly. Excellent service and Kenny was on time, explained everything very well. Refreshing to see that business and customer service are still a priority. Thanks. Outstanding Service! !Could not be happier. Love the Bug Man. They are easy to communicate with. If I have any questions or concerns they are always on top of it. Great customer service! Always pleased with the service provided by this company. If ever I have any problems in between quarterly treatments they come out, no charge and remedy this situation! Arrived on time. Thorough explanation of what the annual service included and what it didn't. The Murfreesboro office location is also very helpful in scheduling. I like their online portal, too, for seeing service details and making new appointments. Overall, I'm satisfied with the service so far. If I could make any criticism at all, it would be that the employees carry enough cash to produce small change - my service person couldn't make change out of $20, so I had to overpay a bit. Very knowledgeable and professional regarding termites. Great job with patching drill holes from Termidor treatment. Will recommend your services for termite control to others. I have been using The Bug Man’s services for years. I have always been satisfied with their results for any pest issues I might have had at my rental homes. They also service my residence quarterly. I had my house treated for termites this past Tuesday (4/2/19). Stefan and his co-worker was very informative about the importance of keeping my property treated against termites and carpenter ants. They told me about how termites and ants communicate and how the "product" is carried into the nests. As my neighbor told me about your company, I will do the same for family and friends. Keep up the good work. Great service! Always on time and professional. I called The Bug Man they came out the next day and have not had any problems since they came out. I appreciated their professionalism and quality of service to my home. I will continue to use The Bug Man. Everyone that comes out to service my home does there job great. Orlando, who serviced our home was very friendly, also thorough and professional. The Bug Man was recommended to us, and we will gladly refer them to our friends. We have been using The Bug Man for all our pest control issues for a number of years here in our Lascassas home. They are consistently helpful, prompt, reliable and always have the answers to our problems. Could not be more satisfied with their service and plan to use them as long as they will have us. David is the absolute best! Thanks for providing such personal service. Rebecca Tran. Awesome customer service and communication. Truly treat their customers as family. We love the service and all the technicians you send are well informed, Travis is a great guy and knows what he is doing. Great personality and manners. Great service. Arrived on time. The rep took time to explain everything to me. They do a thorough job. We've not had any issues with pests for some time, thanks to the Bug Man. Their technician is always very friendly and very helpful with explaining why we've seen some of the bugs that we have. He always does a great job. I have had my home treated by other companies and The bug man is by far the best! I definitely recommend trying this company and deciding for yourself! Met Matt for the first time this week, he was a pleasure to deal with. We are typically never home when you service our home but was pleased to meet Matt for the first time! He asked us if we had anything that needed extra attention. He answered a couple of questions for Cheryl, and was very knowledgeable answering them. It is pretty hard to beat Marcel, but he's doing a very good job trying! Matt, thanks for protecting our home! Friendly and great customer service. They do a good job and take care of any problem we have thanks again. Wonderful customer service and communication with treatments. Very effective in eradicating interior bugs and preventing outdoor pests. Your employees have given-without fail-prompt, courteous, exceptional service with a smile. Thank you! We have been using The Bug Man for our pest control needs since 2011 and have been very happy with them. They are polite, knowledgeable and give us plenty of notice prior to their visit. Always satisfied and of I have any issues, they are quick and always helpful. At this point I am satisfied with the service you provided, not knowing the results yet. I hope the treatment was effective and resolved the bug and cricket problems. Thanks for all you do and your continued service. I’ve been pleased with my service. I was glad to see our regular technician back. Nothing against the other guy, but we like this guy best.